estment from Big Pharma. Looking at Big Pharma R&D investment on income statements can be misleading, because R&D frequently looks like its growing, except when you consider that what you are looking at may be a post-merger income statement. Sure the R&D may have grown 10%, but the combined R&D of two entities may have declined 40%. The graph below illustrates how Pfizer's acquisitions over time should have made a 200,000 person company, instead of just 77,000. 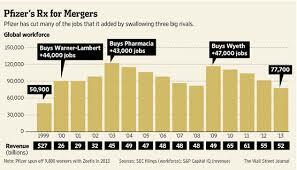 So R&D for Pfizer has surely grown, but the aggregate investment from all the acquired companies surely has shrunk. Long Term Growth Trend for Early Stage Life Science Companies: Here to Stay? “For the full year 2014, life sciences investments reached $8.6 billion, a 29% increase in value over the $6.7 billion total for 2013." Contrary to what entrepreneurs may feel, or what investors may think - startup funding for Life Science companies is red hot. Long-term funding for Early Stage Life Science Companies Poised for Growth. In the white paper titled "Big Pharma R&D Trends Down: Paradoxically, Early Stage Life Science Trends Up", I take this recent trend and discuss the interrelated paradoxes and connections between, long-term declines in Big Pharma R & D investment, Long term increases in Big Pharma Venture and Corporate Development investment, the emerging ascendancy of Chinese investment in early stage Life Science companies, and finally the growing importance of the public sector scientific research on high value but high risk discoveries. What it all seems to point to is that while Big Pharma R & D investment will continue its long-term decline, collective investments in early stage Life Science startups will continue to grow, as a new cast of investors made of up VCs collaborating with Corporate VC arms, and Chinese investors provide the capital needed for the most promising therapeutics going forward. Read the full report now. Download the white paper here.